There were a few dodgy bouts toward the end, especially a henka (sidestepping your opponent at the face-off, a cheap win) that Baruto pulled on Day 12. But it was good to see the gentle giant from Estonia walk away with his first championship. Here’s hoping it’s the beginning of a drive for promotion to yokozuna. Overall, the quality of the sumo was good. The clearing out of deadwood after the match-throwing scandals last year continues to pay off, with lots of ambitious young rikishi trying to take advantage of the unexpected opportunity to advance quickly through the ranks. The ozeki also performed well: except for Kotoshogiku (8-7), they all finished with double-digit wins. Everyone seems pleased to have two Japanese at the ozeki rank now. This was especially true after the tournament began with a symbolic moment highlighting the recent dominance by foreigners. In the Kokugikan arena in Tokyo, they hang giant portraits of the winners of the last 32 sumo tournaments, 6+ years’ worth of champions, from the rafters. In preparation for opening day of this tournament, they took down the last remaining portrait of a Japanese wrestler, from Tochiazumua’s victory back in 2006. It’s been all Mongolians or Europeans since. Maybe Kisenosato or Kotoshogiku, the great Japanese hopes, will end that streak in 2012. The last six or seven years, I have relied exclusively on a single make of ballpoint pen: the black Super-GP, preferably size 0.5, manufactured by Pilot. Whenever I travel back to Japan, I buy up a handful. I like their grip, their ink delivery, their basic feel. The one design flaw is the cap, which after extended use tends to get loose and fall off. Everything else about it is simply perfect. I always carry two, in case one gets lost or malfunctions. A bit compulsive, I know, but sometimes it pays off. Last Thursday night, I arrived in Seattle for the annual MLA convention and rode the Downtown Airporter shuttle bus to my hotel. A few minutes before arriving, I felt one of the ballpoints slip out of my pants pocket. A second later, I heard the sound of plastic hitting the bus floor. The shuttle was moving, though, and it was quite dark inside. I felt around the floor with my shoe and then, when we stopped in front of my hotel, swept the area with my hand, but the pen was nowhere to be found. At least I had a spare, which I used to take notes all weekend at the conference. Last night I flew back to Chicago. After the plane landed at O’Hare and taxied for what seemed like half an hour, we finally reached the gate. I waited for the rows of passengers in front of me to disembark, then made my way down the aisle, briefcase in hand. About halfway to the exit, I spotted it: sitting on the floor of a now-deserted aisle in the economy section, a black Super-GP 0.5 ballpoint. 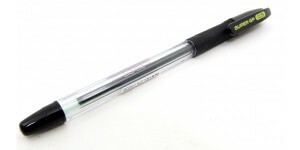 I patted my pocket to see if perhaps my other pen had dropped out, but it was still there. I of course reached down to scoop the pen off the floor, and now I have two again. It really is a fine ballpoint. I recommend it to you. Apparently, it even knows how to find its way home when it gets lost on the other side of the continent. Happy New Year to you! Here’s hoping 2012 brings us all peace and joy. As the traumatic year 2011 wound down in Japan, there were any number of notable music events. Rock veterans Moonriders ended their thirty-five year run with a rooftop concert in Shinjuku, holding the Beatles’ legendary “Let It Be” rooftop performance in London very much in mind. Leader Suzuki Keiichi even ended the set by asking, ala John Lennon, if the group had passed the audition. Here’s a nice Japanese-language report, complete with photographs, from the Asahi newspaper. As always, we welcomed in the new year by watching NHK’s annual musical extravaganza, “Kohaku Uta Gassen.” Among the highlights in my mind were Shiina Ringo’s set (“Carnation” and “Onna no ko wa dare demo”); the borderline political remarks by the all-star indies rock combo Inawashirokos, who before performing their “I Love You & I Need You Fukushima” declared that “nothing is finished yet,” obliquely referring to Prime Minister Noda’s mendacious declaration a couple of weeks earlier that the nuclear disaster was now under control; and Nagabuchi Tsuyoshi’s chilling performance in a live remote from the playground of a devastated school in Ishinomaki, Miyagi Prefecture. Tendo Yoshimi turned in a nice Misora Hibari tribute, as well, while the K-Pop representatives (KARA and Shojo Jidai) acquitted themselves nicely. Lady Gaga contributed video of a nifty performance from New York. Here’s the full line-up of performers from the show. Over the break, we were also able to watch the DVD I picked up in Sendai last month of Kuwata Keisuke’s remarkable September 10 and 11 concerts in Sendai. The shows were held in the Sekisui Heim Super Arena–a facility that served for several months as an emergency morgue for victims of the March 11 tsunami. Kuwata chose to come to Tohoku to launch his first national tour since receiving cancer treatment, and it is clear from the DVD that the concerts were cathartic experiences for both performers and audience. Proceeds from the DVD will be donated to the Japan Red Cross. Let me leave you with the promotional video for Inawashirokos’s charity single, “I Love You & I Need Your Fukushima,” featuring 47 famous actors and actresses (one from each of Japan’s 47 prefectures) singing along with the band in a message of support for the stricken prefecture. What a year it was….